The old boys club. 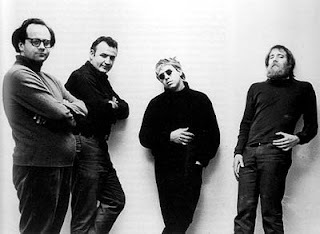 Left to Right: Robert Barry, Douglas Huebler, Joseph Kosuth and Lawrence Weiner. All part of Seth Sieglaub's group exhibition "January 5-31, 1969"
Opinions about the arts community vary greatly within the arts community. By now, I've talked to a few people working as funders, administrators and curators in Toronto, and I've discovered that there are generally agreed upon regulations (galleries exist through funders, curators organize artists, galleries promote their artists and exhibitions), but the details get confusing: what money should go where? who should be giving money? which type of gallery should be exhibiting which type of artist? along with investigation into what the desirable and effective relationship between artists and institutions should look like.From the perspective of someone trying to make it into the field, it seems like my best option would be to play along, promote copacetic relationships and learn to play the game using the guidance of the general, agreed upon regulations. Or at least to begin with. Some choose not to play along, instead forging a more divergent path; something I had forgotten how to do after battling with stifling university curriculum for the past 6 years . I recently met with Derek Liddington, Director of XPACE who has indeed trodden a path of internal ideological and action oriented resistance. If you look back through the history of art, it is easy to be reminded of the many arts professionals - artists, writers, curators - who have found success through rustling some feathers, being independently minded and asserting their opinions, whether they were popular or not. Remember when we could stick up for ourselves and have independent ideas? While searching for a job it seems to be the opposite goal, instead trying too hard to mold one's identity and experiences into the desires of any given institution; making ourselves into an alternative version of ourselves when we should be approaching things as real, independently minded people with a specialized and particular skill set applicable in many different and creative ways applicable to many aspects of the cultural field (I say 'we' as recent graduates with cultural degrees). It's a tension between what we ideally want out of the job market with what the job market wants out of us. Liddington is a great 'advocate' (a word with stronger political associations than he desires) for the under-30 crowd. During our meeting, he happened to reinforce an observation I made in the September 19th post (Gallery TPW: Round Two) about the abrupt and alarming lack of networks and structures after post-secondary graduation. There is a multitude of opportunities for students, but institutional focus and funding seems to have run out for recently graduates. It's possible that the people, committees and advisers in charge of creating work grants and new positions are convinced that graduates have already gotten all the experience they need by the time they are handed their diplomas. Surprisingly, that's not real life. Liddington's personal interest lies in promoting a shift in focus from a structure of training to one of continued support. What are arts organizations doing for the younger generation ready to apply their new exciting ideas and initiatives to the community? Not much. If you're a 25 year old arts administrator, curator, artist, writer like myself, you already know the situation. There's a generational divide, and it's blatant. The people in charge of galleries and funding distribution today, both artist-run centres and larger public institutions, are run by older men and women with impeccable educations and experience in multiple facets of the arts and culture field but, in many cases, they are ingrained in older methods of practice (maybe more to the academic side than the practical business side? ); once-upon-a-time radicals in the festishized hey-days of the 1960s and 1970s, but not so much today where the economy and community has changed drastically. Funny thing is that these older models persist - take a look at any of the institutions called artist-run centres today and the vast differences from one to the next in Toronto - they aren't artist-run centres any more. Then there's my generation, who understands what has come before and knows that things need to be taken in new directions, or at least wants to desperately find out for themselves what these directions could be (what do new artists need? where's the money at...or where will it be next? what's the relationship of critical writing to the physical exhibition? what's the role of the curator after the realization of the curator-as-artist vs curator-as-facilitator and the new era of post-relational aesthetics?). Then to follow us will be the graduates with real university degrees in arts administration programmes. Liddington's 'radicalism' comes from his insistence on a network for us in-betweeners, the new graduates, below 30 years old with applicable education and experience. This shouldn't be radical, of course. It's probably time to demand opportunities for ourselves within the field by first recognizing, that yes, it's not working for us and then deciding that something really needs to be done about that because it simply isn't beneficial for any of these generations involved (except maybe for the ones that want to keep their jobs until they're pried from their desks in high towers after rigor-mortis sets in). Wow Ginger. This is the first post I've seen on your blog, and it's excellent. I'm fresh in Toronto after a summer of travelling and am in exactly the shoes you're describing. I'm finding myself faced with the dirty deed of getting a job that will pay my rent, but in the process am having to rethink what it is I think the arts community is and what I hope to bring to it. I'm looking forward to getting to your other posts, and wish you the best of luck. Let's have a drink and a chat some time. This issue of being yourself and owning your individual skill set is so interesting to me. I think that the art community, museums included, attract a slightly neurotic, off-the-beaten-path type of person so to ask us to fit a standard model seems ridiculous. I'm not one to sell a falsified, more perfect version of myself, but I try, as most people applying for jobs would, to make myself as appealing as possible. And yet I don't know why there wouldn't be more leg room or more of a recognition that people are naturally different, flawed, and uniquely capable. During my internship at the AGO we had someone come in to do personality assessments so that people could get to know their co-workers and understand that people have natural and innate differences in how they work and navigate the world. I thought that was a really decent thing to do. As much as we have to make concessions and work hard to get ourselves established, we should also remember that who we are isn't a bad thing, and even if we may have to gloss ourselves up a bit, we will be able to impact the art world based on our skill set and not what we're supposed to be. I agree with you Meghan about fostering unique personalities, or if 'unique' is the wrong word, I mean individuality. Even when looking for jobs with the urge to promote ourselves (skills and personality) in a way that's more in line with what the employer may want (regardless, I'm never going to lie and say I love working with kids)we should still stick to our guns and know our own strengths so that we may apply our know-how to any job - to trust that we can always bring new knowledge to the table that will prove valuable. I don't however agree with you on the issue of personality tests. I think they are limiting (borderline insulting) and only place more insensitive and improbable categories on people. Personalities and quirks should not be institutionalised; people should be more direct and accepting of the people they have to work with. I'm sort of with both you and Megan on the personality test issue. On the one hand the AGO at least made a gesture towards promoting understanding among co-workers, but it's true that the compartmentalizing of personalities into a testing framework is pretty unrealistic. Your blog brings up a lot of difficult issues for the arts community Ginger, and your thoughts are all really valuable and insightful. As ridiculous as it is, have you thought about using twitter to advertise the blog? You've really got something good here, and it's a shame there isn't more traffic. Best of luck on the job hunt.